We’re in Stern 1888, Brno’s relatively new Jewish restaurant and my Dad is barking out a joke about Jews. I’m sitting with my head in my hands, studying the pristine white table cloth in immense detail, and trying desperately via body language to communicate to the rest of the restaurant my pre-emptive disapproval of whatever punchline is about to tumble out. Entirely oblivious to my discomfort, or more likely relishing every moment of it, he’s ambling through the joke set-up, occasionally doubling back on himself and chuckling as he teases another strand from the recesses of his memory. There is some really nice stitching on this table cloth. This is a quality table cloth. Somebody has put a lot of thought into the décor of Stern. Candelabras sit on every table with a strategic number of candles lit. Brass chandeliers with just the right amount of tarnish hang from the barreled ceiling. Gilt-framed period paintings clutter the wall. Up-lighting on the pillars is the only noticeably modern touch, and adds a nuanced luminescence to what might otherwise feel staid and dim. It has the atmosphere of a top tier restaurant. I know little about the Slavic style Kosher food served in Stern, so feeling out of my comfort zone I ironically turned for advice to the one man for whom the total annihilation of my comfort zone is a personal calling. Having escaped Czechoslovakia as a runaway fourteen year old, my father spent several years hopping from refugee camp to refugee camp in post war Europe, feeding himself by fencing supplies stolen from the back of US Army trucks, before ending up in London. Somewhere in between his childhood and mine he picked up a love of Jewish cuisine, but the circumstances have always remained a mystery to me. We start with soup. 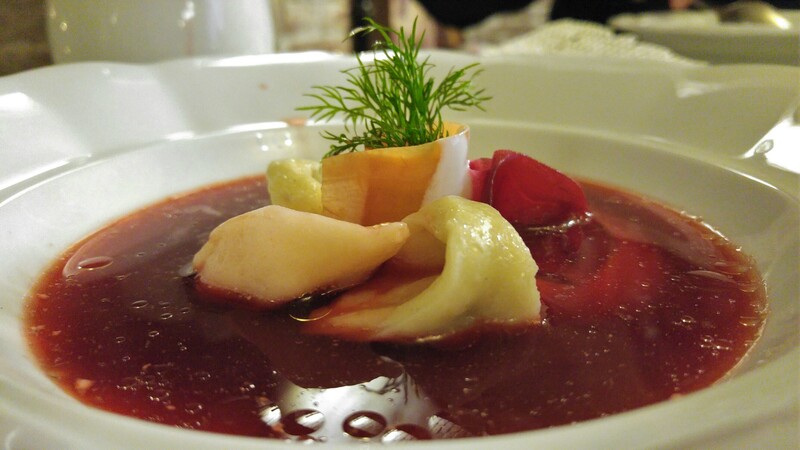 I opt for the borscht, which is served in a jug and poured over mushroom dumplings (kreplach), some beetroot slices, fennel and a spoonful of sour cream. The presentation is very nice and the flavour is too. It is sweet, it is sour, and it is beetrooty. The tortellini-like dumplings provide a satisfying umami accent. I ask about his childhood experiences with Moravian Jews. “Well, I was too young to remember much before the latter part of The War… and by then most had been… moved”. “Your Grandfather was best friends with a Rabbi. Your Grandmother was an an anti-Semite.” “A lot of people were back then. I was too.” This is an intimate revelation. I feel like an archaeologist brushing dust away from a bone. Rib of beef is his main course, I’m having pancakes stuffed with tomato and beef mince. Mine is good. The filling is a special highlight, juicy with hot flavourful oil, a rich meaty taste, and perfectly seasoned. The pancake wrapping does the job but it feels like a beef-mince-delivery-system rather than something that actually accentuates the taste or texture. Dad’s rib is a bit of a disappointment. I’m used to beef rib being roast, or stewed, but this one looks as if it’s been boiled or steamed. It’s wet, but there’s no sign of any sauce except a smear of pale mustard. Without any browning it looks anaemic. The rhythm of the Samba coming from the other side of the table announces the next stage of Dads dining ritual; “needs salt”. He loves salt like someone’s about to take it away from him. Frankly it’s an almost unprecedented show of respect for the Chef that he tasted it first. Sometimes when he’s shaking it onto a meal, I feel compelled to interrupt him mid-sentence to check he hasn’t forgotten what he’s doing. But I taste it and he’s absolutely right. 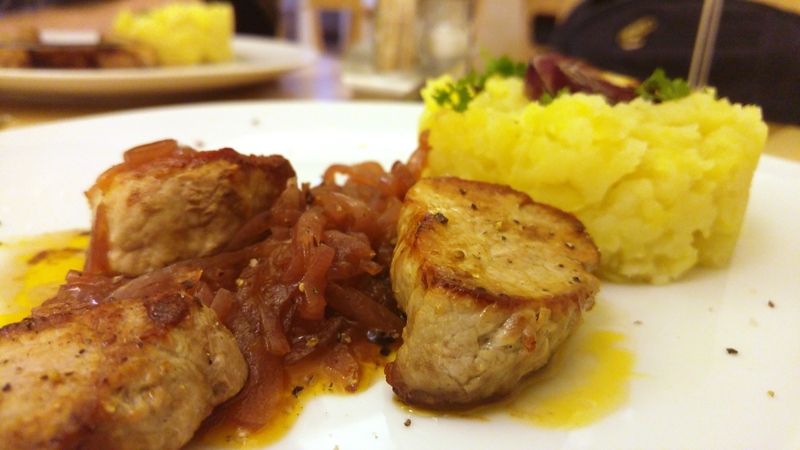 This is highly unusual – Czech chefs usually season food the same way their counterparts in highway maintenance season frozen roads. After he arrived in England he was passed on to the Czech Refugee Trust Fund, where he was taken under the wing of a Mrs Henry and a Mr Seton. “I had nowhere to go so I lived in their office. Mrs Henry brought me books, comics, clothes, food. Mr Seton showed me London, and helped me with my English. After some time they managed to enrol me in a school. Obviously my parents couldn’t accompany me so Mr Seton took me on the train. It’d been a long time since anyone had cared for me. I felt like I must be such a bother. So whilst we ate some sandwiches Mrs Henry had packed for me I decided I should apologise… I wanted to tell him I appreciated everything he was doing… everything they’d both done. Mr Seton turned to the window. “I must thank Mrs Henry for the sandwiches,” I ventured in my still basic English. I could see he was thinking. “Is this ham?” I asked. We sat there unspeaking, the clack-clack of the train punctuating the silence like ellipses. Stern’s a decent place. The service was excellent, and it’s not expensive despite feeling like it should be. Ironically everything else being delivered to such a high standard left me underwhelmed by the food. Though I know little about this type of cuisine, from an objective standpoint I think there’s room for improvement. However, as an overall experience it’s worth a visit.